Do you remember the north side of Armour between Campbell and Charlotte? Anchoring the block at the northwest corner of Armour and Campbell, the Samuel E. Sexton home today looks much like it did when it was built. A 1909-1950 Sanborn map of the block shows the large mansions along Armour Boulevard, and blocks of more modest homes lining Campbell and Charlotte Streets. Like much of Armour after the 1920s, the south side of Armour in this block was converted to apartment hotels. 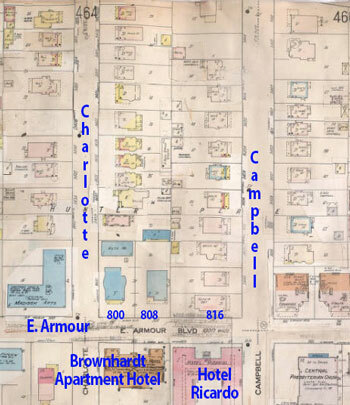 Much has changed along Armour Boulevard since the early 1900s, but one block, the north side of Armour to 34th Street from Campbell to Charlotte, remains much the same. One of the Armour mansions is no longer there, but the remaining homes of the block look pretty much the same as they did when they were built. As part of our Uncovering History Project, the Midtown KC Post is taking a look at the 1940 tax assessment photos of each block in Midtown. This week we’re focusing on the block from Armour Boulevard north to 34th Terrace between Campbell and Charlotte Streets. (Many people seem confused by the tax assessment photos, which all include a man holding a sign. Here’s the story behind them). Armour Boulevard at the turn of the 20th century was a newly-built thoroughfare of mansions, homes to some of the wealthiest and more influential people in Kansas City. This block was no exception. At 816 E. Armour, Samuel E. Sexton of the Hucke & Sexton Contracting Company lived in a large home. Another well-known businessman, William Huttig, lived at 800 Armour. Huttig was the founder of Western Door and Sash and contributed to the construction of Convention Hall and the Baltimore Hotel. A third home once stood between these two. The Armour homes in 1940. 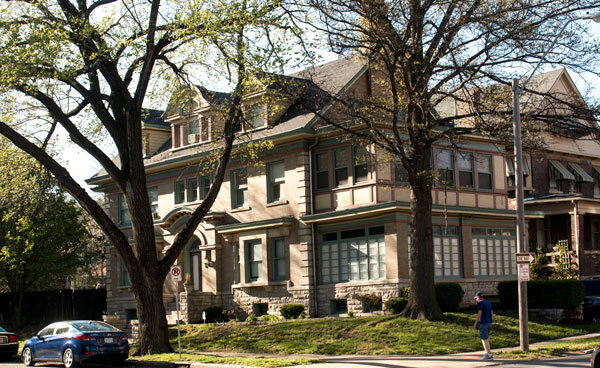 As part of the new Hyde Park area of Kansas City, the homes along Charlotte and Campbell Streets filled in with middle-class residents including Frank Askew, a city councilman in 1910 (3440 Campbell) and Hugh Sheridan, a retired farmer from Edina, Mo. and his son (3427 and 3429 Charlotte). At this home at 3434 Campbell in 1910, Mrs. J.H. Hawthorn entertained 125 guests at a “delightful tea,.” “The reception room was decorated with pink carnations and pansies. The Dutch window in the dining room was filled with white peonies, which a basket of Killarney roses stood on the tables. The mantels throughout the different rooms were banked with ferns,” according to a newspaper report from the day. 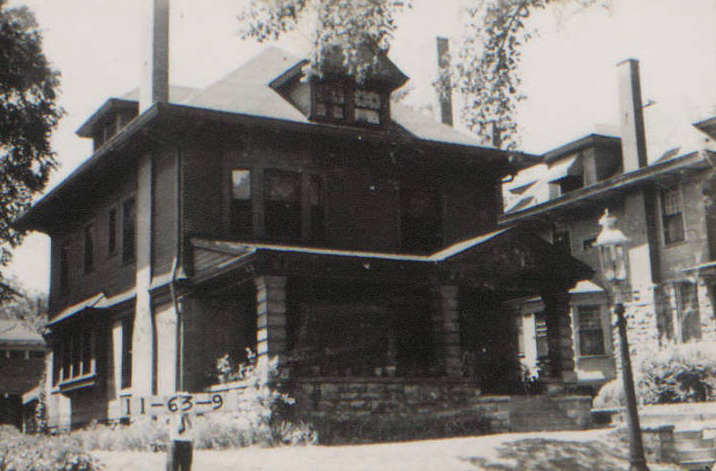 This photo shows the home in 1940. Here’s a look at the block of Charlotte between 34th and Armour as it looked in 1940. Here’s how the block of Campbell between 34th and Armour looked that same year.